Manchester United fans across the world are still savoring their massive victory over Paris Saint-Germain at the Parc des Princes. The Red Devils eliminated the Ligue 1 champions from the competition after handing them a 3-1 home defeat. Ole Gunnar Solskjaer’s men went into the game without 10 key players, who were either missing through injury or suspension. Anthony Martial, Juan Mata, Nemanja Matic, Alexis Sanchez and Ander Herrera were left out of the match-day squad due to injury, while Paul Pogba was suspended. However, the English giants showed enough character and zeal to overturn the 2-0 loss they suffered in the first-leg at Old Trafford. An early Romelu Lukaku goal set the tone for what was to become a historic night. Although PSG equalized through Juan Bernat, a second goal from Lukaku ensured Man United went into the half time break leading 2-1. PSG created a number of decent chances in the second half but were thwarted by David de Gea, while Bernat’s accurate shot could only hit the post. There was drama towards the end of the game, though, as Man United were awarded a penalty. A shot from Diego Dalot appeared to hit the arm of Presnel Kimpembe and, following consultation with VAR officials, the penalty was given. Marcus Rashford stepped up and planted the ball firmly behind Gianluigi Buffon to make it 3-1 to Man United and 3-3 on aggregate. Despite initially being touted as a mission impossible, Solskjaer’s men managed to get the job done far away in Paris. 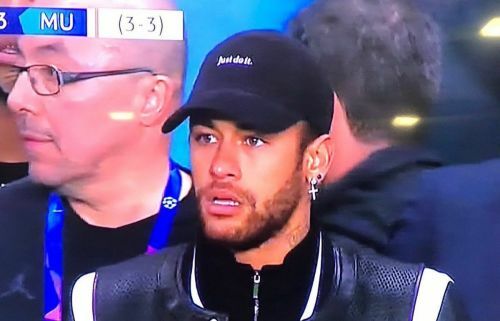 As United fans celebrated, one man who was unhappy with the penalty decision was Neymar, who was seated in the stands. The Brazilian is currently injured but took to social media to slam the referees. Twitter has since descended on the 26-year-old, with many making fun of his facial expression when Rashford scored Man United’s third goal. Reporter: Neymar jr, whats your take on the match?